Caffeine is normally harmless when ingested by healthy people. However, it is a good idea to use caution when drinking caffeinated beverages if you are currently taking certain medications. Zithromax is an antibiotic available in a number of forms, including a pack of six 250-milligram tablets commonly known as a "Z-Pak." Although caffeine is not known to cause serious interactions with this antibiotic, there are reasons that you might want to avoid caffeine while taking this medication. Your liver breaks down caffeine through what is known as the cytochrome P-450 oxidase enzyme system. This process breaks down a number of drugs and prevents chemicals from building up in your bloodstream. Zithromax and caffeine are both broken down through the same pathways in your liver. If you start using a Z-Pak and then consume caffeine, it can reduce your ability to metabolize caffeine. This can lead to higher levels of caffeine circulating in your blood. The result can increase your risk for side effects such as irregular heart rate, according to the authors of "Drug Metabolism: Current Concepts." If you regularly consume caffeinated beverages, it is beneficial to discontinue prior to starting a Z-Pak. 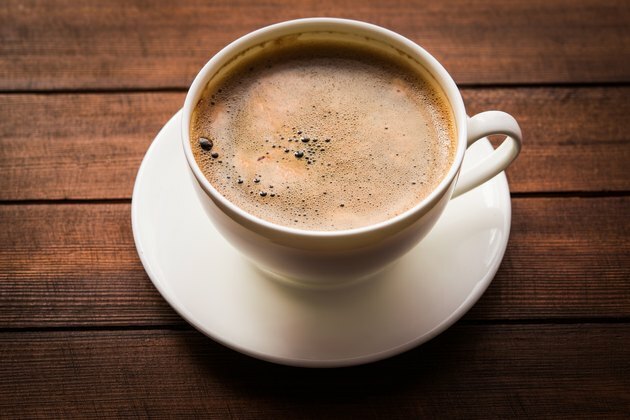 Continuing regular caffeine consumption and then starting a Z-Pak can decrease the effectiveness of this medication, according to Paul Ortiz de Montellano, author of "Cytochrome P450: Structure, Mechanism, and Biochemistry." This is because the same liver pathways are needed to break down both drugs. Disrupting the effectiveness of antibiotics increases the risk that the bacteria might flourish, which jeopardizes your recovery. Caffeine affects your immune system, according to a review published in the September 2006 issue of the journal "Pharmacology and Therapeutics." If you are prescribed antibiotics such as a Z-Pak, consuming caffeine might jeopardize your own ability to fight infection. The review reports that caffeine has the capacity to suppress antibody and lymphocyte production. Both types of cells are needed to fight off infections. Talk to your physician about the risks of consuming caffeine while on a Z-Pak. It might be a good idea to avoid caffeine at the first sign of infection due to the possible immunosuppressive activity of caffeine. If you choose to drink caffeine anyway, pay attention to your symptoms. Reduce your consumption if you experience heart palpitations or jitteriness. It could be a sign that your body is metabolizing the caffeine slower due to the Z-Pak. Pharmacology and Therapeutics: Immunomodulatory Effects of Caffeine: Friend or Foe? How Do Caffeine Pills Affect the Body?